Today is a sea day, and the last day of our Empress of the Seas cruise to Cuba, and we've got the "ast day blues" in a big way. Being at sea was a welcome change, as somehow the days felt short this week and I didn't get to enjoy the ship as much as I'd have liked. This summary will be a short one though, as we worked hard to do very little but relax, a vacation within a vacation, but we did get to explore the ship some. Today we woke up around 9:00am after setting the clocks forward overnight, which means it was 8:00am in our brains and a very early hour compared to what we're used to. 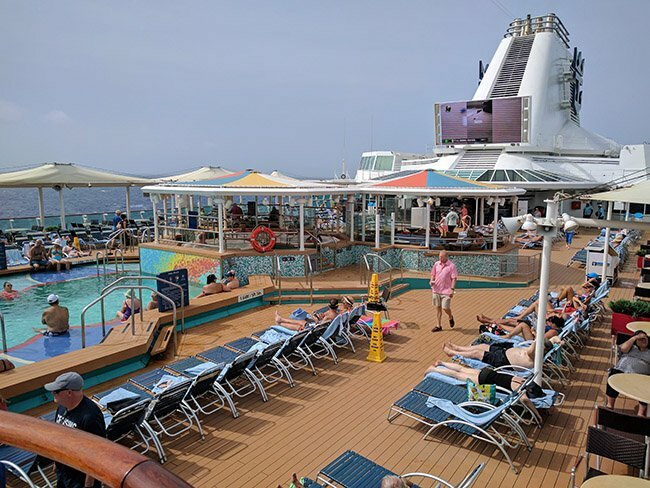 We usually find it easy to oversleep in an inside stateroom, but the excitement of a cruise full of friends heading to a new destination got us moving a bit earlier each day. Today however what got us up was the desire to live every minute of the last day. For breakfast, we opted for the Windjammer, which was not anything special but it seemed a good way to get in and out quickly compared to the main dining room, which we'd already enjoyed for brunch a few times. 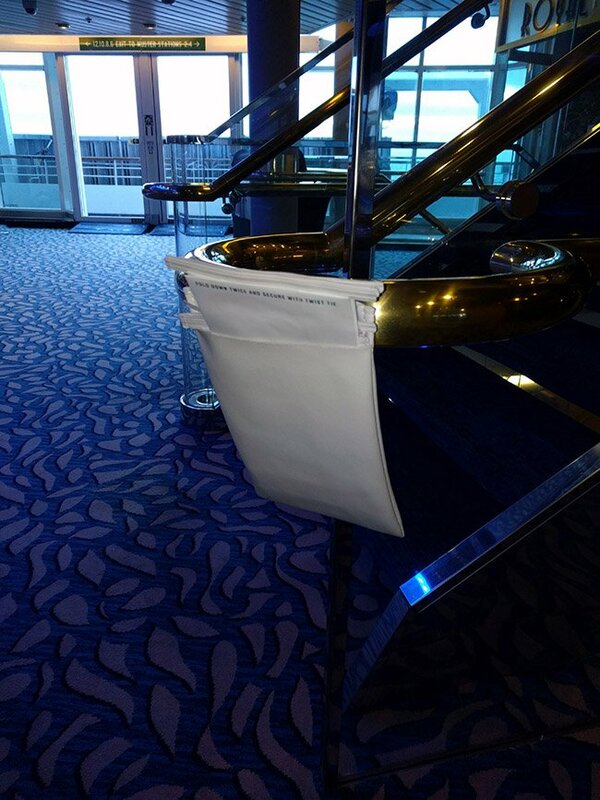 I did notice that a couple of staple items in this Windjammer are different than they are on other Royal Caribbean ships. For example, the breakfast potatoes and the donuts are both completely different recipes â not bad, just different. After breakfast, we took a walk across the pool deck and found that there were some people out early, but plenty of space left. From there we went to Boleros for espresso. I've been surprised that there haven't been longer lines at Cafe Royal, which is nice. That in mind the quality of the espresso seems hit or miss. It may be they're better equipped to make Cuban coffee, which has a ton of sugar. Either way I got my fix and we took a stroll. Schooner bar has been the main meeting place and watering hole this entire cruise. 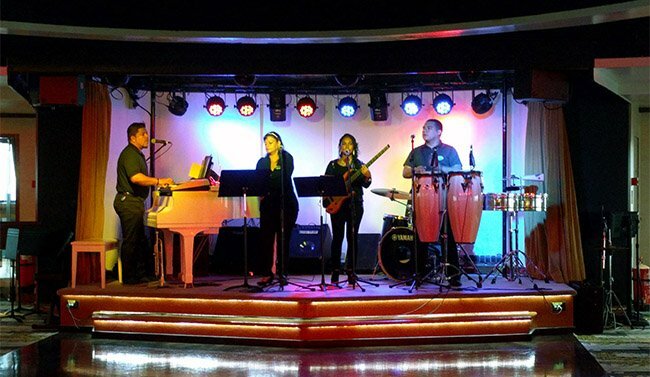 I really like the venue, and the location is fantastic (midship, next to guest services and such), though I'd have thought we'd spend more time in Boleros. It was a bit early for a drink, but I'm on vacation, so we again found ourselves at the Schooner bar where Ashford, the barkeep, insisted we start and finish the second bottle of Ardbeg they brought on for us. This was the beginning of some serious peer-pressure from Ashford (who is awesome by the way). 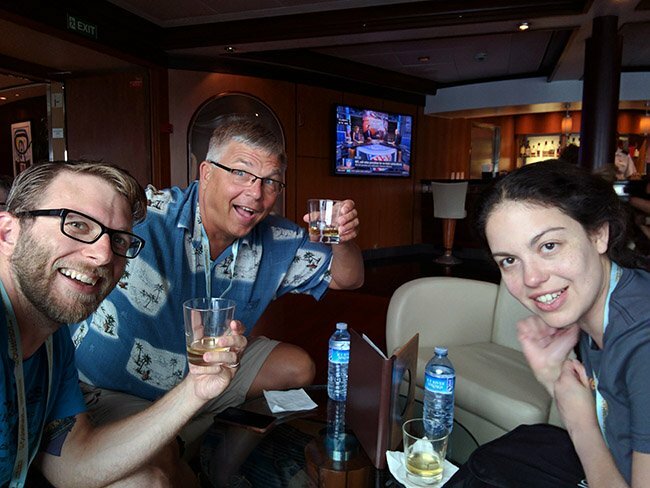 As I sipped scotch I had a brief Twitter exchange with James Van Fleet, Royal Caribbean's meteorologist who pointed out some storms Empress was going to be cruising near. This is a nice reminder how many people work hard to make these trips safe and enjoyable. Several drinks in and while waiting to meet up with friends I decided we are on a cruise and should probably see the outdoors and get some fresh air. Heading to deck 10 the "Sexist Man" contest was going on. Personally, I don't care about the belly flop contests and these other pool events, but they are crowd pleasers and I'm glad others enjoy them. This is when the weather started looking a little less than desirable as some the storms became visible, but folks were still enjoying time by the pool. Heading back to the Schooner for some more time chatting with friends new and old we quickly realized it was time to eat, and the Windjammer called our names. By the time we sat down to eat there was a decent amount of rain that had moved in, and it was neat looking as the water ran off the windows of the Windjammer. Notice by the way that the Windjammer on Empress is situated forward, where as the other ships in Royal's fleet feature the Windjammer to the aft. 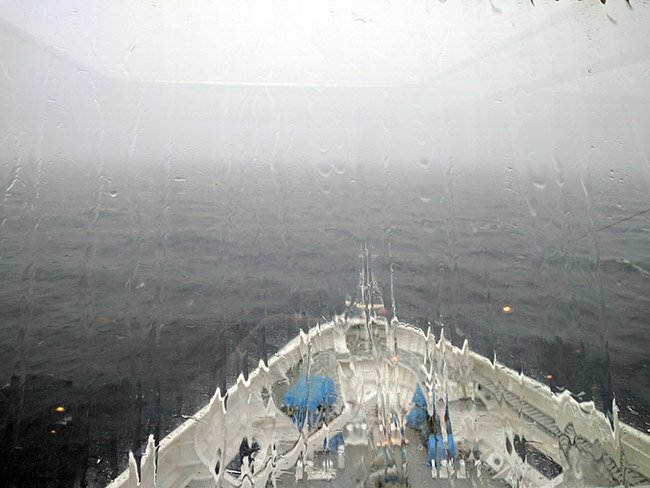 That rain on the glass, a nice lunch, and perhaps the four glasses of whisky I'd had left me fading fast, so we headed to the stateroom for a bit to begin packing and take a short nap. Yes, we did more than just drink today. Funny as it seems on such as small ship, we realized there were some spots we hadn't really explored and other spots we wanted to enjoy more time in. 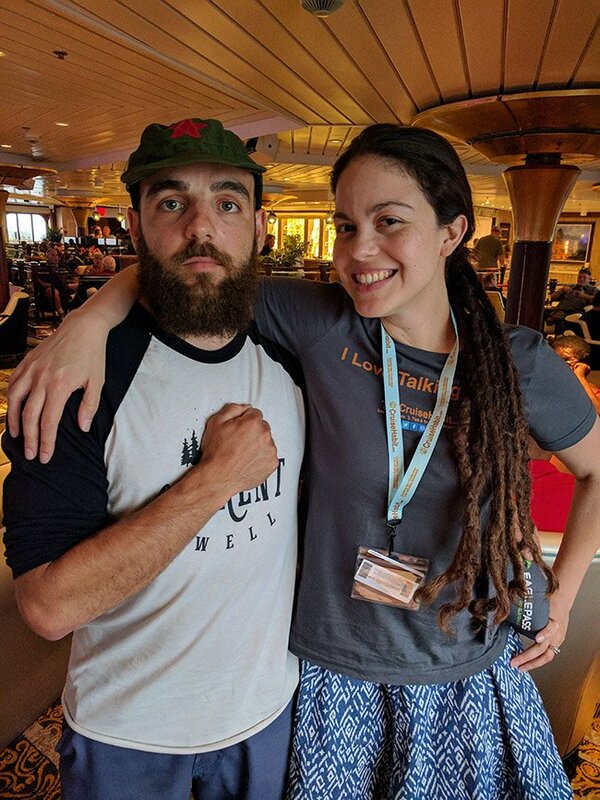 We walked around, listened to some live music in Boleros, and saw our new Aussie friend Luke (actually I think he lives in BC) who we threw an olive cover on and had him do his best Fidel impression. We then started walking all the way forward on the promenade and found that on several decks there are neat view of the bow. Nothing special, as it's just hardware, but it's a perspective I'd not noticed on other ships. These areas sit in front of stateroom windows, and there is a shortcut to get there if you're in one of these rooms, so while the area isn't private, you essentially have a secret/rarely trafficked area overlooking the bow. 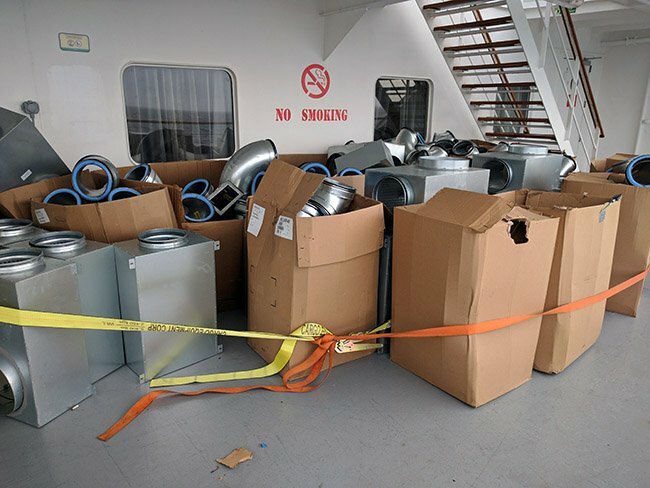 One of these decks through had some A/C parts stored there, but I realize they're actively doing A/C work in the Casino, so hopefully this is short-lived - I'd be annoyed if that was my room window in the picture, but perhaps it belongs to a contractor or officer. It occurred to Larissa and I that we'd not seen any of the shows onboard, and we'd heard good things about tonight's show, "Three". I'm a sucker for mashups and such, which were the default shows on ships for years. I expected something similar to this, and the show was billed as having music from multiple decades, but it was bit different in that it was largely covers or mashups of pop-music, and I was having trouble figuring out if there was any attempt at weaving a theme in. The performers themselves were all talented, and from a choreography standpoint they were all in sync, which doesn't always happen. I did feel a few songs had performers singing outside their range, which seemed odd with so many singers to choose from. The back of the stage was also used for a number of scenes and effects, seemingly using rear-projection. It looked good, but in a few cases, may have been a bit distracting. What I really enjoyed about this show however (not taking away from the talent at all), was the theater itself. There was a time that ship theaters had clusters of tables and chairs, neat layouts that made them feel like a lounge, and were conducive to drink service. Newer ships have turned to stadium/theater seating, which I understand from a logistics standpoints, but Empress has the layout of ships of the past, and I really liked that. Overall it was a pretty room, too, with nice accents and furnishings. I'd like to see this style come back, but I won't hold my breath, despite some recent changes I've noticed in ship design. In the last year or two Larissa and I started going to the buffet area of ships for dinner more and more often. Not that we don't like the main dining room experience, and we still go frequently, but the flexibility and variety of a good buffet is nice. 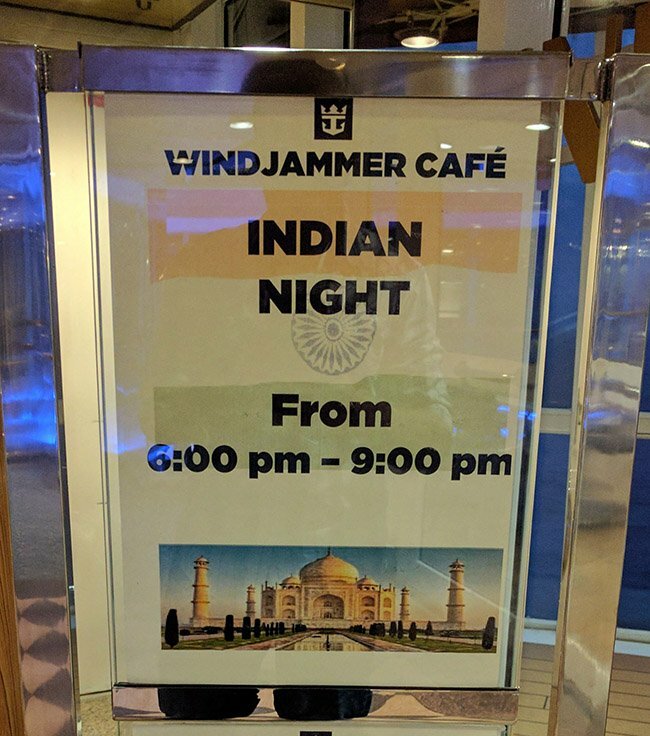 Any trouble we may have had deciding which venue to enjoy tonight dissolved the moment we realized that it was Indian night in the Windjammer. Decision made, we love Indian food, and this helped me work through how upset I am about the cruise being nearly over. The food was good, and they had more than just curries, which was nice. I was surprised though they didn't have rice, which seemed strange. I asked about getting some and they said they'd be glad to get me rice but it would be ten minutes. That's reasonable, but I told them not to worry about it as there was so much food to choose from already. After some Indian I sampled what, based on how I feel right now, must have been about 43 desserts. The Windjammer doesn't tend to have very rich desserts aside from their daily "feature", like the crepe station yesterday, but I found a few of the cakes to be good. Frankly, if the cakes were richer I'd not have been able to sample so many, so we'll call it a win. Once finishing dinner, we headed back to the stateroom to finish packing, frantically shoving everything we could inside the bags we're checking to make things as easy as possible tomorrow. We both have to work in the morning, so while we're not looking to be the first off the ship, we can't do what we sometimes enjoy, which is taking it easy on the last day and being the last ones off, walking off along with the consecutive cruisers. I'm hoping for a simple process tomorrow considering the low passenger load, though I've quickly become spoiled having Global Entry lines in PortMiami and Port Canaveral, a luxury we won't have tomorrow in Tampa. I'm also hoping I get to bed before we enter Tampa bay, as I do like these storms rocking me to sleep. Earlier in the live blog I mentioned that while you can tell the ship is older by its design, it seems in great shape. This is true, though over the days I've noticed some minor things that show age. 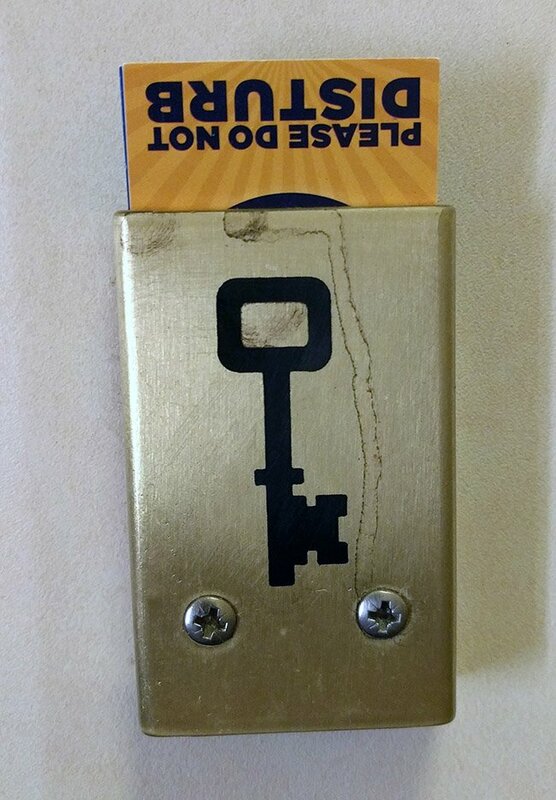 Doorjams, a keyholder in the stateroom meant to hold an actual key, missing screw covers, etc. All minor things that don't in any way negatively impact the experience. 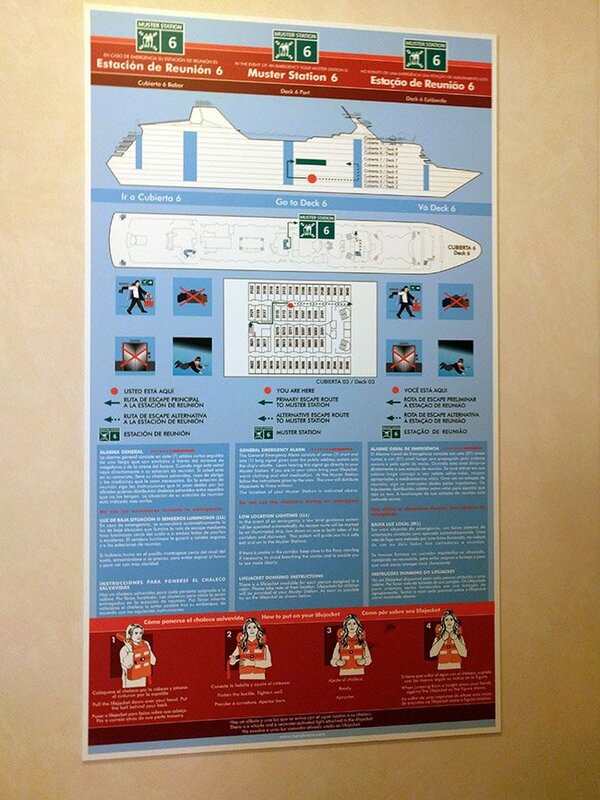 The muster info cards in the room are red, and while they look brand new, I wonder if they're from the ship's Pullmantur days. Because this was our only sea-day they packed all the activities into one day. Multiple types of trivia, bingo, pool games, etc. It seemed a jam-packed day, but maybe it's just been a while since we took a cruise shorter than 7 nights. There are sea-sickness bags taped to railings, though we really did seem to dodge the rough weather. It's quite pleasant right now. I'm still working on fulfilling some requests for specifics on Empress, but if you have questions or comments don't hesitate to comment below or reach out on Facebook or Twitter!